A restaurant serving good food is like a triple bond. It guarantees good returns, does not have a speck of dirt within a thousand miles and spreads a good flavour around. It is also bloody hard work trying to ensure it continues to generate good business. 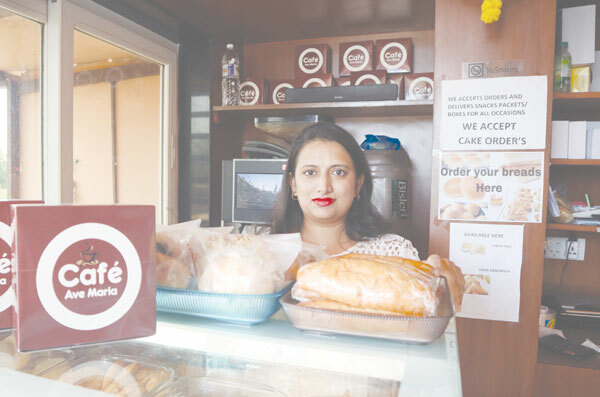 Café Ave Maria has caught the fancy of consumers in Taleigao as well as in Panjim with the quality of its products as well as the promptness of its service. For an outlet that commenced operations in January 2018, how does it manage to sustain its quality as well as grow consistently. Jessica Rebello, one half of the husband and wife team who handles the production side of the business, said it was all about planning and executing it. The family had a taxi business but were keen on expanding their business and looked at the restaurant business seriously. It had all started with them looking at options to help a friend set up a business in this sector but they eventually decided to get in themselves and went for it. They set up an outlet in Bambolim and ran it quite well with the production taking place from the existing base in Taleigao. But the hassles were too much and they then decided to focus on their operations in Taleigao. This kind of an outlet was new in Taleigao, a fast-growing suburb of Panjim and more importantly such kind of an outlet was just not present in the capital city. Open seven days a week the café offered croquets and proper Goan dishes which were generally missing in restaurants in Panjim which focussed on offering Indian fare considering the tourism trade. The couple decided to start off simple by offering pan rolls, samosas and around six or seven other dishes. It clicked in Bambolim initially, three months later they opened this outlet. The outlet was also inspired by an outlet they had visited in Colva and were keen on doing something similar. In the first month itself of setting up operations in Taleigao, business was good and it has witnessed an upswing ever since. They take catering orders as in they prepare and deliver the food but they will not serve it at weddings or other similar functions. The skills sets required are completely different. Jessica believes the food which is prepared with that typical Goan touch will mark them from the rest of the competition. The raw materials are sourced locally and a very sharp eye is kept to maintain that standards don’t slip. An extra layer of fat can ensure that a consignment is not accepted. Asked how easy or difficult it was to conduct business in Goa, she said since the property was theirs, a whole set of hassles were removed from their plate. The taxes being levied however did not make for a very pleasant experience. They however have plans to expand on the outskirts of Panjim. They are looking seriously at locations near the casino’s but then factors like the rent being levied will also have to be considered. They firmly believe there is a space from such an outlet in Panjjim considering that there is nothing similar to what they are doing, existing in the city. She insists that expansion is very good but it should suit them. The division of labour is expected to stay the same with her husband handling the marketing and she staying focussed on production. The days ahead look interesting but they intend to approach it with caution and common sense.